The right to prosecute is in principle exclusively granted to public prosecutors. In addition, public prosecutors are granted broad discretion upon prosecution. However, a public prosecutor may misjudge a case and make a decision of non-prosecution concerning a suspect who should be prosecuted. For this reason a system for appeal against the disposition of non-prosecution by a public prosecutor has been established: request for reviews by Committee for the Inquest of Prosecution and application for committing the case to a competent district court for trial (also referred to as the “quasi-prosecution procedure”). Committees for the Inquest of Prosecution (of which there are currently 165 nationwide) are established with 11 members chosen by lot from those listed on the electoral register for a term of six months. Upon receiving a request or the authority to do so, the Committee reviews the disposition of non-prosecution made by a public prosecutor and makes a judgment on the case as being “appropriate for prosecution,” “inappropriate for non-prosecution,” or “appropriate for non-prosecution” or makes a “decision that the case shall be prosecuted” (prosecution decision). Conventionally, decisions of Committees for the Inquest of Prosecution had no legal binding force and public prosecutors themselves made the final judgment on prosecution after taking into account the decision of the Committees. The Act for the Inquest of Prosecution (Act No. 147 of 1948) amended by the Act for Partial Amendment of the Code of Criminal Procedure, etc. (Act No. 62 of 2004) introduced a system where prosecution can be instituted based on a decision made by a Committee for the Inquest of Prosecution under certain conditions. Under this system, which came into force on May 21, 2009, if a public prosecutor had not prosecuted a case but a Committee for the Inquest of Prosecution decided that the case should have been prosecuted and subsequently if a public prosecutor decided not to prosecute the case again or did not prosecute the case within a certain period of time, the Committee for the Inquest of Prosecution would be required to re-examine the case. If the Committee for the Inquest of Prosecution decides that the case should be prosecuted as a result of that re-examination, the court designates a lawyer to conduct the duties of the public prosecutor in the case (designated lawyers) and the designated lawyer then prosecutes the case and maintains the trial of the case pertaining to that decision. Table 5-2-1-1 shows the number of persons received and disposed by Committees for the Inquest of Prosecution over the last five years. 1,911 of persons received in 2008 were for penal code offenses. By type of offense, the abuse of authority was the largest in number with 282 persons, followed by negligence in the pursuit of social activities causing death or injury with 275, counterfeit of documents with 273, injury with 190, and fraud with 160. 128 persons were received for special act offenses and Labor Standard Act violations were the largest in number with 24 persons (Source: The General Secretariat, Supreme Court). 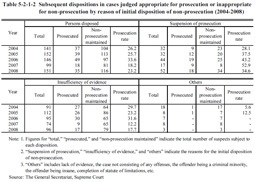 Table 5-2-1-2 shows the subsequent dispositions taken by public prosecutors in cases that were judged appropriate for prosecution or inappropriate for non-prosecution by reason of initial disposition of non-prosecution over the last five years. From 1949 (after the enforcement of the Act for the Inquest of Prosecution) through to 2008, a total of 153,136 persons were disposed by the Committees for the Inquest of Prosecution and 17,320 persons (11.3%) were judged to be appropriate for prosecution or inappropriate for non-prosecution. Among these, 1,408 were prosecuted, and 1,254 were convicted (435 sentenced to imprisonment and 819 to fine) and 80 found not guilty (including Menso adjudication and dismissal of prosecution) (Source: The General Secretariat, Supreme Court). The application for committing the case to a court for trial is a system that enables a person who has filed a criminal complaint or charge for an offense committed by public officials, including abuse of authority, etc. to apply to a competent district court for committing the case for trial if they are dissatisfied with a public prosecutor's disposition of non-prosecution. The district court renders a ruling on committing the case for trial if such a request is well-grounded. As a result of that ruling, prosecution of the case is deemed to have been instituted and the court then designates a lawyer to conduct the duties of a public prosecutor (a “designated lawyer”). The designated lawyer maintains the trial of the case. In 2008 the number of persons received in an application for committing the case to a court for trial was 304 and the number of persons disposed was 201. The decision to commit to a court for trial was made in one case (Source: Annual Report of Judicial Statistics and The General Secretariat, Supreme Court).